What is a moment? What is a mechanical advantage? How do you calculate the turning effect of a force? Why are the turning effects of a force so important? Where do we apply the advantages of the turning effect of a force? Forces can cause an object to rotate and the turning effect of the force is called a moment. If a resultant force acts on an object about a fixed turning point (the pivot) it will cause the object to rotate e.g. turning a nut with a spanner, applying a screwdriver, opening a door fixed on hinges. The pivot might also be called the fulcrum. and d (m) is the perpendicular distance from the pivot point to the line of action of the force. The perpendicular distance d is the shortest distance between the pivot point and the line of action of the force. You get the maximum moment by pushing/pulling the spanner at a right angle to the line (d) between the pivot point and the line of action where the force is applied. This is illustrated by the simple diagram of a spanner above. The turning force is F x d.
The pivot point is the central axis of the bolt on which the nut is being turned by the spanner. 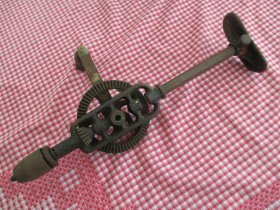 To tighten or loosen the nut you apply a force, to best advantage, at 90o to the spanner itself. Applying the force at any other angle less than 90o reduces d and so reduces the effective moment of the force. You determine the force F by how hard you push/pull the end of the spanner, but d is a fixed distance for give spanner. This is one of many situations where you are applying a force to increase the effect of your hand muscles. The size of the moment increases with increase in distance d or applied force F.
The longer the spanner, the greater is d, hence the greater the turning force generated - the greater the mechanical advantage of the lever system. More on the physics of unscrewing a tight nut! With the longer spanner, and applying the force perpendicular (at 90o) to the line from the point of applying the force to the pivot point (centre of the nut or bolt), you generate the maximum moment (F x d). If you apply the force at any other angle than at 90o to the perpendicular distance line (d), d will always be shorter and hence a smaller moment is generated by applying the same force as in situation A. With the shorter spanner, despite applying the force at 90o (perpendicular), d is smaller and you cannot generate as large a moment as in situation A. Calculate the moment if a force of 5.0 N is applied to a spanner 15 cm long. Q2 A force of 20 N is applied to a door causing a moment of 5 Nm. Calculate the distance in cm from the hinge axle to the point on the door where the force was applied. Q3 What force must applied to a 30 cm long spanner to generate a moment of 6.0 Nm? The left diagram illustrates a balanced situation (equilibrium) where a ruler is pivoted in the middle and two weights w1 and w2 are placed at distances d1 and d2 from the pivot point. Remember weight = force in newtons. For the ruler to be balanced in a perfect horizontal position the two turning forces must be equal. Here we use the terms clockwise moment and anticlockwise moment for the two turning effects of the forces involved. the ruler is balanced horizontally, at equilibrium when the turning effects of the forces are equal. This situation conforms with the principle of moments which states that when the total sum of the anti clockwise moments is equal to the total sum of the clockwise moments the system is in equilibrium and the object (system) will NOT turn. When a system is stable (no movement) or balanced it is said to be in equilibrium as all the forces acting on the system cancel each other out. You see this when you do a simple experiment balancing a rule on a pencil and putting small weights on either side until balanced. Similarly, when a the nut of a bolt is tightened, there comes a point when the moment you are applying is balanced by the opposing moment of the bolt and nut and you cannot tighten the nut anymore. The middle of a seesaw is the pivot point. If two people of equal weight sit on either end, the seesaw is balanced horizontally - the clockwise and anticlockwise moments are equal. 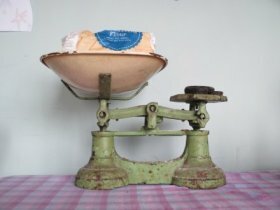 If the two people differ in weight, the seesaw will drop down on the side of the heaviest person because the clockwise and anticlockwise moments are unequal. Examples of simple calculations using the above situation. In this case the anticlockwise moment = clockwise moment, so the ruler is balanced horizontally. identical twins on a seesaw will be balanced !! BUT, by applying an alternating extra muscle turning force, you can have great fun !!! In this case the anticlockwise moment > clockwise moment, so the ruler will rotate anticlockwise. In this case the clockwise moment > clockwise moment, so the ruler will turn clockwise. 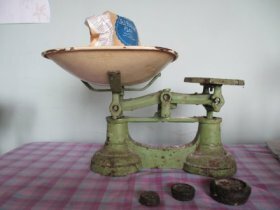 The beam of the scales should be horizontal when the bowl and weights plate are empty (d1 = d2, w1 = w2). 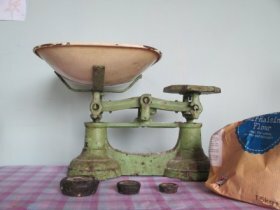 When the object to be weighed is placed in the dish, the scales tip anticlockwise down on the left. You then add weights until the beam is horizontally balanced again, thus giving the weight of the material e.g. flour in the bowl. If w1 is 12.5 N and 3.5 m from the pivot point, what weight w2 is required if placed at 2.5 m from the pivot to balance the beam? A beam is placed evenly on a pivot point (fulcrum). On one side a 10 N weight is placed 2 m from the pivot point and a 40 N weight a further 4 m from the pivot point. How far from the pivot point must the centre of gravity of an 80 N weight be placed to perfectly balance the beam horizontally? Therefore the 80 N weight must be placed on the left 3.25 m from the pivot point. Q4 This calculation is the sort of thing civil engineers and architects have to consider in the construction of 'modern' buildings. A 5.0 m aluminium beam is suspended by a steel cable from a concrete beam and 3.0 m along rests on a steel pole. Assuming gravitational field force is 9.8 N/kg, calculate T, the tension in newtons in the supporting steel cable. The weight of the aluminium beam = 9.8 x 200 = 1960 N.
moment = force x perpendicular distance from turning point. You consider the weight of the aluminium beam to act through its centre of mass 2.5 m from either end, but it is 0.5 m from the steel rod which is effectively the pivot point on which you base your moment calculations. Its actually the same situation as a wheelbarrow described further down the page! Many of the examples described below involve a lever, which is a means of increasing the rotational effect of a force. You push down on one end of a lever, and the rotation about the pivot point can cause the other end to rise with a greater force. The diagram below illustrates the principle of lever to gain a mechanical advantage - its all about the d1/d2 ratio. F is the force involved (N) and d (m) is the (shortest) perpendicular distance from the pivot point to the point where the force is applied OR generated. Therefore by making d1 much bigger than d2 you can produce a much bigger output force compared to the original input force. Generally speaking you make the distance d1 much bigger than distance d2 - you can see this using scissors, levering a lid off a can and its a very similar situation when using a fork to lift deep tough roots out of the soil or moving a heavy stone with a pole. 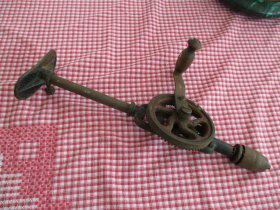 So, levers are very useful because they make lifting and moving things much easier by reducing the input force necessary to perform the task. Suppose a heavy manhole cover requires a force of 160N to open it. Imagine you have a steel bar 1 metre long pivoted at a point 0.1 m (10 cm) from the end to lever open the heavy manhole cover. If you press down with a force of 20 N, will the upward force you generate be enough to lift the manhole cover? The 180 N exceeds the 160 N required, so could lift the manhole cover. This machine can punch holes in a material. The pivot point (turning point) is on the left. We can analyse this situation in terms of turning forces. Therefore by making d2 'long' and d1 'short' you considerably multiply the force F1 compared to F2. So you are able to easily punch holes in a strong material e.g. sheet of metal. So the force you manually apply is multiplied 10 ten times, not bad for a little effort! In other words you need less force to get the same moment. When you press the scissor hands together you create a powerful turning force effect close to the pivot point. So, by making d1 >> d2, you create a much bigger out force F2, sufficient to crisply cut through paper or card. That's why you apply the blades to whatever you are cutting as near as possible to the pivot point. 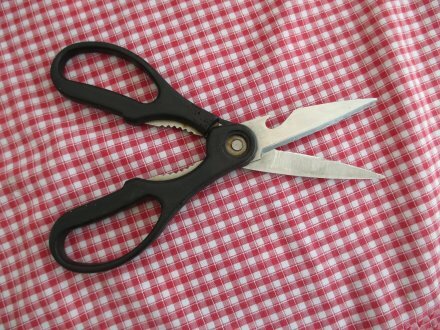 You don't cut using the ends of the scissor blades where you gain little mechanical advantage i.e no significant multiplication of the force you apply. Its the same principle as described in the whole punch machine described in (a) above. 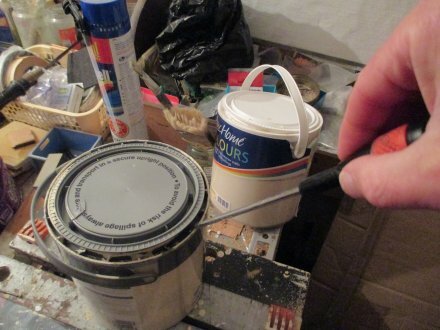 You can use a broad bladed screwdriver to get the lid off a can of paint. The pivot point is the rim of the can. The length of the screwdriver to the pivot point (d2) is much greater than tip of the screwdriver beyond the rim (d1). F1 x d1 = F2 x d2, F1 = F2 x d2/d1, so if d2 is much bigger than d1, you get a great magnification of the force you apply (F2) to give a much greater up force (F1) to force the lid off. 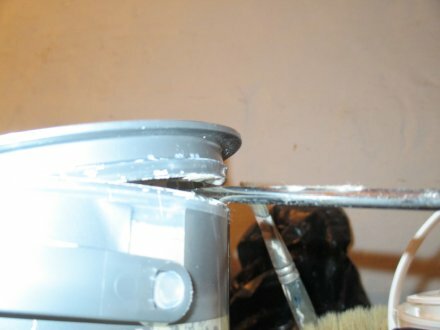 Another example of needing less force to get the same moment to do the job of opening the can. 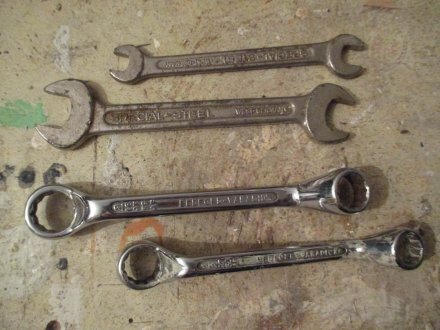 Spanners have long handles to give a strong turning force effect. Spanners were discussed in detail at the start of the page. The radius of the handle is much greater than the boring rod. 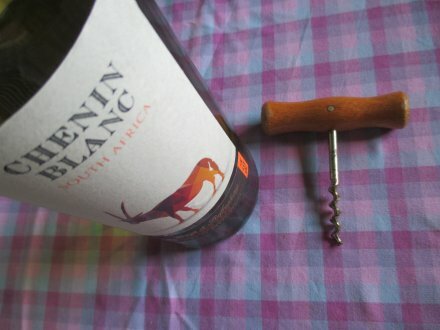 The great difference in radius gives you a much greater torque (turning force effect) to bore into the cork stopper of a wine bottle. 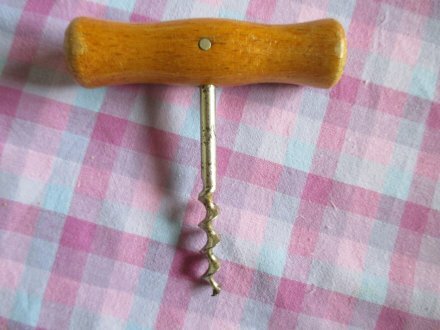 The argument for a screwdriver is the same as for the corkscrew above. 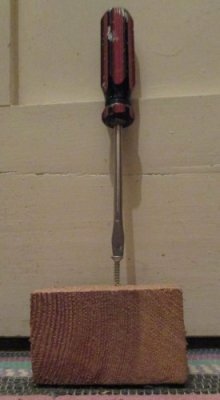 The greater the diameter of the screwdriver 'handle' compared to the diameter of the screw head, the greater the force (torque) you can apply to drive a screw into wood. 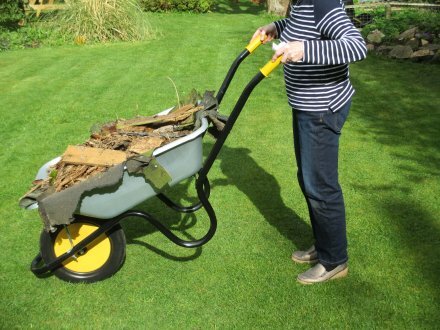 The handles of the wheelbarrow are much further away from the wheel axis than the centre of gravity of the full wheelbarrow is the yellow blob!). The wheel axis is the pivot point about which you calculate the two moments involved. F1 is the weight of the loaded wheelbarrow acting from its centre of mass (centre of gravity). F2 is the force you exert to lift the loaded wheelbarrow. The 'weight' moment F1 x d1 is a small moment to manage the weight of the wheelbarrow. However the 'lift' moment is F2 x d2 and so a smaller force F2 is needed operating at the longer perpendicular distance d2 to lift up the wheelbarrow and its load. The magnitude of the lifting force F2 is much less than the weight of the load, so you can lift the barrow and move it along. Another example of needing less force to get the same moment to do the job of lifting the wheel barrow to move it along. 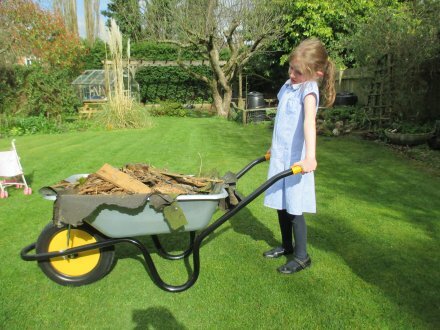 Six year old granddaughter Niamh can barely lift the wheelbarrow off the ground (just a few cm) but Granny Molly has no trouble lifting the barrow to move it along. 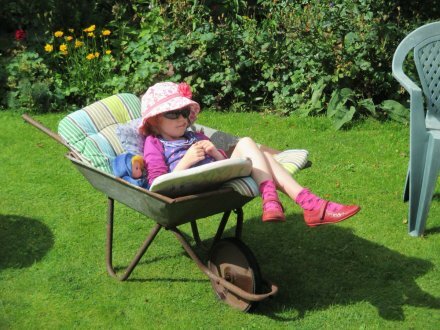 At an earlier age Niamh wasn't quite as interested in science! Cog wheels are circular discs with teeth and components of many machines in transport and industry. When several of them are combined together (linked in contact) a rotational force can be transmitted when fitted in contact with each other. Through the interlocking, one cog wheel can turn another in the opposite direction i.e. if one gear wheel goes clockwise, the gear wheel in contact with it will go anticlockwise, no matter how many gear wheels are connected together. By using different size cog wheels differing in the number of teeth, you can increase or decrease the force generated by the turning effect of the gear wheels. From the gear ratio you can work the revolutions of one gear wheel with respect to the neighbour wheel e.g. in the diagram gear wheel 1 has 12 teeth and gear wheel 2 has 18 teeth. If the smaller wheel 1 turns once, wheel 2 turns 2/3 third of a revolution, teeth ratio 12/18 = 2/3 (0.66). It the larger wheel 2 turns once, wheel 1 turns 1.5 revolutions, teeth ratio 18/12 = 3/2 = 1.5. The teeth ratio gives you the gear ratio. - shorter distance from the teeth to the axle pivot point. - longer distance from the teeth to the axle pivot point. As moment = force x distance, the ratio of the two moments of the ears is equal to the ratio of the gear radii which equals the ratio of the teeth. If you transfer the force from a larger cog wheel (gear wheel of more teeth) to a smaller cog wheel (gear wheel of less teeth) you decrease the moment of the 2nd as you have decreased the distance from the applied force to axle pivot point. No mechanical advantage is gained - you haven't increased the output force of the smaller cogwheel. The smaller cog wheel will be made to turn faster than the larger cog wheel. This is a way to increase rotational speeds in machines. If the first cog wheel has 20 teeth and the second cog wheel 5 teeth, one rotation of the first wheel causes the smaller wheel to rotate 20/5 times = 4 x more - a gear ratio of 1 : 4. If it was the other way round and you rotated the 2nd smaller cog wheel first, one turn of it would only rotate the larger cog wheel by 1/4 (5/20) of a turn - a gear ratio of 4 : 1, decreasing the speed of rotation. If you transfer the force from a smaller cog wheel (gear wheel of less teeth) to a larger cog wheel (gear wheel of more teeth) you increase the moment as you have increased the distance from the applied force to the axle pivot point. A mechanical advantage is gained - you have increased the output force of the larger cogwheel. By using a set of interlocking gears that get bigger and bigger you can multiply the moment of the first small gear. The larger cog wheel will turn more slowly than the smaller one. This is the way a relatively low powered machine can be made to lift heavy weights. If the first cog wheel has 8 teeth and the second wheel 56 teeth, you need to turn the first wheel 56/8 = 7 times to completely rotate the second wheel. The large cog wheel turns a smaller cog wheel at much greater speed with good old fashioned muscle power! The force is transmitted from one cog wheel to another. Since a larger cog wheel of more teeth drives a smaller cog wheel of less teeth, the output is a high turning speed of the drill. 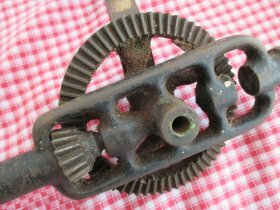 Complex machines such as you find in older flour mills and textile mills, use gears to utilise the power of the e.g. water wheel, to transmit a force to drive the machinery with the required speed and power. A slow rotating water wheel driving a cog wheel system ( a gear system) can produce high speeds of rotation to drive a spinning machine - an important mechanical feature in the Industrial Revolution from the 18th to the 19th century. Clocks use gear wheels to transmit the potential energy of the spring and move the arms around at the correct speed to indicate the correct time. Different sized gear wheels are need to operate the minute and hour hands. The minute hand must go round 60 x faster than the hour hand, so the gear ratios will take this into account. Q1 A 25 toothed gear wheel is in contact with a 2nd gear wheel with 5 teeth. When the first wheels is turned twice clockwise, in what direction does the 2nd wheel turn and by how many times? The 2nd gear wheel must turn anticlockwise - it must turn in the opposite direction. Argument: The 25 teeth of the first gear wheel will move 25 teeth of the smaller gear wheel. Since the 2nd smaller wheel only has 5 teeth, the 25 teeth of the larger gear wheel will move it 5 times per revolution and this is doubled for two revolutions of the 1st larger wheel. The gear ratio is 5 : 1.